We are very thankful for our wonderful donors for helping us fulfill our mission. We are thankful for scholarship donors that make it easier for our students to fulfill their dreams and aspirations. We are very appreciative of the many donors that help fund our school grants that support school improvement programs, technology and career academies. We also sincerely appreciate those helping our Millard families in crisis. We continue to help many families get the support they need to keep their children in school. We wish you all the best for Thanksgiving. Each year our 25 Kids Network sites partner with the Millard Business Association Project Wee Care program and give back to our Millard community by sponsoring a school supplies drive. Our Kids Network sites have collected over 4,000 school supply items to donate. We appreciate all of those who donated and helped out during this years community service project. We are so fortunate to have such amazing staff & families that love to give back to the Millard community! Are you planning a reunion? High school reunions involve a lot of coordination. There are dates to save, venues to reserve and catering to organize. We can help you by designing postcards, posting information about your reunion on our website and providing a list of addresses for your classmates. 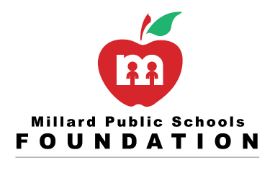 For more information, contact the office at foundation@mpsfoundation.org or call (402) 991-6710.